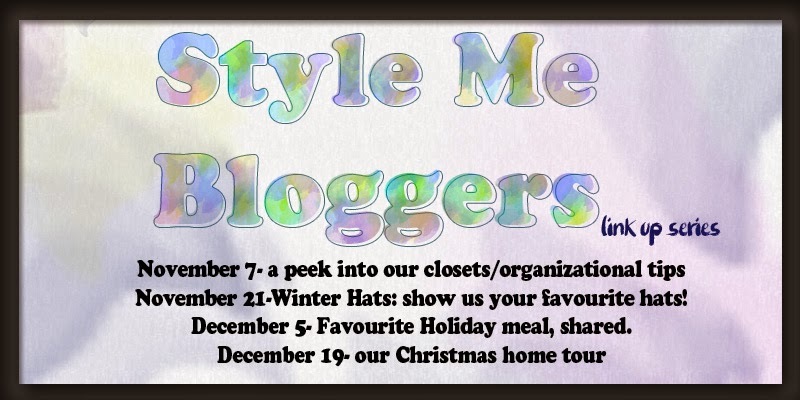 Today is an exciting day - it's the first link up of the Style Me Bloggers - and today we're sharing a peek into our closets! I suspect that Deena chose this topic, because she has the most amazing closet. I may or may not have a serious case of "Deena's closet" envy. I, on the other hand, do not have an amazing closet. We purchased our house from family friends who had it custom built. Gretchen wasn't that interested in clothes, but she loved to cook. Consequently, I have a tiny closet, but a beautiful kitchen! To add insult to injury, I share this tiny space with my hubby. As soon as one of the boys flies the nest, I'm kicking his clothes to their room. I haven't mentioned this to him yet, but I'm sure he won't mind. Of course, he thinks the problem is the size of my wardrobe, not the space. He's wrong. Since I want to be a good sport, I'm sharing a picture of my closet. Very underwhelming, but it's neat and tidy. Trust me, I pack a lot of stuff into this small room! I'm in the process of switching my clothes to the huggable hangers, which I've found at Target for the best price. My dream closet belongs to Lisa Vanderpump, of Real Housewives of Beverly Hills and Vanderpump Rules fame. I could put a little bed on the floor and live in this room - it's that beautiful. AND it has a chandelier. I'm really excited for our new collaboration! I hope you'll link up with us today, or in two weeks for our favorite hats. Be sure to check out everyone else's closet, and watch for a special giveaway coming soon! Your closet is definitely very neat and organized! Thanks - it's a work in progress! Your closet looks very nice and is still bigger than mine! lol What are huggable hangers? The slim velvet covered hangers - they used to carry them at Costco but I haven't seen them there in a while. Clothes don't slip off of them, and you can fit more into your closet (much to my hubby's dismay)! Ya, what are huggable hangers? I'm intrigued! I love the organization in yours- I am definitely lacking that. Huggable hangers - see above :)! What are you talking about - your closet is wonderful and organized and lovely!!! I've been trying to teach my daughter - A little organization, a lot of stuff put away. It's a work in progress. Your closet is fantastic! Mine has my clothes. Husby's clothes and cute dresses from when my girls were little that I just can't bear to part with. Oh, and costumes that don't fit into the seven wardrobes we have in the basement. Sigh. P.S. I'm not sending you a picture of said closet. I value your friendship . . .
We would still be friends even if I saw your closet! The boys' things that I can't part with are in another closet at my house....shh, don't tell my husband! My biggest complaint about my closet is that a tall person built this house ... and I am not! We have talked about lowering my hanging rack, but in the meantime, I guess it provides some good stretching exercises throughout my day! So funny Susan! Always good to get a little exercise while you're getting dressed :)! I know, they're both dream closets! How do you like the huggable, space-saving hangers? I bought a few and haven't used them yet. You run a very neat, organized show here, ladybug. I love the hangers - I wish I could afford to do them all at once, but I've been buying some each month. There's lots of room in there!! :) And seriously Lisa Vanderpump's closet....crazy fabulous!! I know - I really want to live in her closet! I have a terrible closet! Cassidy's stuff can't even fit into it so he has to use the guest bedroom closet. We dream about a real master bedroom with a bathroom with a tub and walk-in closets. Sigh. I'm slowly edging my hubby out of ours, poor guy. I do have a great soaker tub, but I have to confess we never use it (don't hate me :)! I have a large closet but I'm still tempted to move all of Hubs' stuff out of my domain! I know, their stuff just muddles everything up! Thanks, I don't feel that organized, but I'll take your word for it! Your closet looks so nice and organized. Mine, on the other hand, would be an embarrassment for me to show ANYONE, ha-ha! Thanks Marcia. I bet you could write something very funny about closets! You closet looks good to me! It's realistic and practical. It's a walk-in too so that's more than what so many others have, right? Do you remember that lady from Texas whose giant closet (3 floors!) got featured on Good Morning America? Now that's just TOO MUCH! Your closet is so organized! I share a small walk in closet with the Hubs and it's always a disaster! Such a fun idea for a post and linkup! Thanks Jill. It's a work in progress. Your closet looks so much better than mine! And my husband keeps scooting my stuff over which is really annoying. Women need 3 out of four hanging areas, right? Well, we really need the whole thing. Men don't need closets, do they? 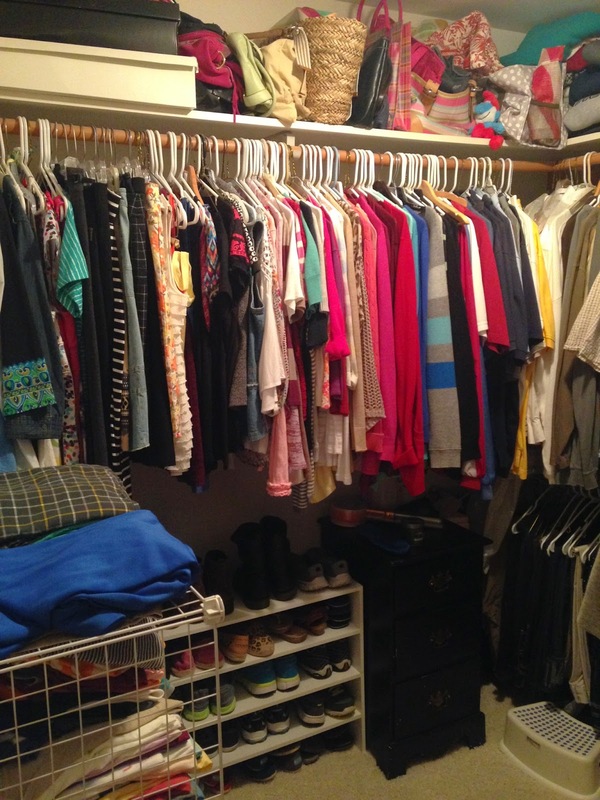 Very organized closet! I love huggable hangers. They have those at Costco sometimes too for a really good price. Home Goods has them too, I just bought 25 for $9.99 I believe. I started the huggables when they just sold them at Bed Bath and Beyond and I would save up my coupons to use on them, hehe. :) and I agree, men really don't need closet space, take my closet, Mr. has very little closet space, haha. A few months ago, he realized how much I encroached on his space...haha. Only took him 5 years to notice! Thanks for the tip on hangers at Home Goods. I will check them out! Sadly my closet is pitiful and I'm like your friend. Big kitchen little closet! You should take whichever boy leaves home first and turn it into your closet!!!!!!!! I love Lisa Vanderpumps closet also I saw that one a while back. I just don't do alot of clothes shopping but grocery shopping that's my thing haha! Probably explains why I'm not a big clothes shopper! I like the idea of turning one of the boys' bedrooms into a closet for me - my hubby thinks it's going to be a study but I might have other ideas! Thanks Barb - one of my favorite link ups!